This week I made the trip to The Neon, Newport to watch Dragon Pro Wrestlings Thursday Night Throws. This opening contest featured Toon Town’s favourite wrestler, (It Happens…..) OLIVER SUDDEN, as he faced off against someone who was making their professional wrestling debut. The ‘Father of Sin’ entered with two large masked men alongside him before disappearing to the back. This was a nice fun opener with Oli doing his best to put smiles on the faces of the people in the crowd with some humorous moves and reactions while being very playful with the more serious Fletcher. He didn’t take kindly to being made fun of in his big moment and made sure to bring Sudden down a few pegs with sharp strikes and calculated moves. In the end though, it was the people’s support that got Mr. Sudden through this debutant as he ended the match with his Sudden Impact (Air Raid Crash) for the win. A nice showing by Fletcher for sure, but Oli’s edge in experience and being more known by people helped him in the end. This was a lowkey David VS Goliath type of battle with the quick paced Carlos Vega facing against ‘The Lost Boy’ Flynn Burden respectively. Carlos started if fine out speeding the bigger Flynn, but he wasn’t able to outrun him for long as the lost one came at him with clubbing strikes and big powerhouse style moves. Carlos was able to fight back with great use of his more agile move set. He even had the match won at the end with a Double Underhook DDT, but the impact of the move sent Flynn rolling out of the ring, which got him enough time to recover and kick out of the pin when he was sent back in. The challenge that Vega faced proved to be too much of a…. BURDEN in the end (Sorry not sorry), as Flynn hit the ‘End Of The Line’ Gutwrench Powerbomb for the win. Flynn continues to be a truly imposing force that is making his mark in Dragon Pro. This one didn’t disappoint by any means. Before they started the match Chris was quite upset that he wasn’t competing for the All Wales Women’s Title, but promised us, one day…. HE WILL! These are the types of dreams we can all aspire to push towards. This match brought the night up to a new level as we got to see a more aggressive side of Sierra than we usually see. She made use of her sick strikes and signature hip attacks, but seeing more agile moves from her like headscissors takedowns and suicide dives and even more aggressive in her regular move set with some extra tricks is not as common for her. Chris seemed very much ‘wholesome’ in his interactions with Sierra to begin with, but as the match went on, he brought that vicious side of his out with his many strikes and pulling out some big moves that usually put away most of his other opponents, yet the Women’s Champion kept coming back for more. It was all too much for Loxton in the end sadly as Brookes was able to win the match with a Double Underhook Piledriver for the pin. After the match he brought Sierra back into the ring to raise her hand out of respect. He really is such a wholesome boi isn’t he! After a quick interval and the usual Attack/Dragon Pro raffle (we all know how those go), Merlin brought out the current Dragon Pro General Manager, current half of the Dragon Pro Tag Team Champions, AND the NEW Attack! Pro Wrestling Champion, Wild Boar. He gave a note to Merlin to speak for him on his behalf, cause you know, boars can’t speak like people. What you thought they could? Not this time. He basically thanked everyone for supporting British Wrestling and more importantly the new faces appearing for Dragon Pro. But before the note could be finished, ‘Wrestling’s Greatest Show’ arrived! Compiling of Alexander and Mill Martinez Jnr, alongside their uniquely voiced harlequin mouthpiece, Harri Golightly, they appeared to congratulate Boar on his Attack Pro Wrestling championship win, but then brought attention to another title he has, and that being the Dragon Pro Tag Team titles. Their complimentary comments soon turned into disparaging ones, which aggravated Boar to say the least. He kept stepping towards them, which only got Mil angrier. CYRK then attempted to outnumber Boar, but before they could attack him, ‘Dragon Heart’ Danny Jones made the save, as Harri kept saying they were coming for Boar and Flash Morgan Webster’s tag team titles. This match was the shocker of the night honestly, as it featured the now universally loved Brendan White, who has won over the people for the last few Dragon pro shows with his matches, facing off against another debutant in Erik Von Lovegun. Looking like he came straight out of a bad rom-com (and I mean that in the best way), this new face seemed very self-arrogant right off the bat, egging Brendan on with weak slap to the face. Obviously Bronco wasn’t pleased and went on the strongman offensive for the opening portion of the match. It wasn’t until Brendan hit his knee on an exposed bottom turnbuckle which Lovegun sneakily undone, that the flow of the match would change. Erik then targeted Brendan’s knee through the rest of the match with dirty manoeuvres and some sickening submission holds. Brendan managed to bring the people to life the more and more he got beat down, and was able to come back with more of his known powerhouse styles moves. However, things took an unfortunate turn as while the referee Huw was seeing to something in the corner, Erik gave Brendan a low blow (look it up if you don’t know. It’s dirty, but not THAT KIND of dirty, if you know what I mean) and got him in a small package pin to get the upset victory. This didn’t please the people to say the least as Brendan looked even more dejected knowing he lost in an unfair way. Since debuting, Jay Jewel has been making a name for himself on the Dragon Pro roster and has even branched out to get more recognition as one of the ‘Young Lions’ in Will Ospreay’s Frontline Wrestling promotion, where he has been stacking up some equally impressive wins. His opponent was another debut for Dragon Pro, but one with a lot of experience working for other places in the UK, Malik. This was as stiff as matches could possibly go. During one exchange where they are trading sharp kicks to each other, the next they are slapping each other across the face for ten seconds straight. While Malik had many tricks up his sleeves, the Hard Hitter was in the end no match for the Diamond’s lightning fast countering into different submission, where in the end he got the visitor Malik to tap out to a Rear Naked Choke. The two shook hands in what was the most eye-opening match of the night. As Nothing To Prove entered first to the disdain of the crowd, their ringleader, Eddie Dennis got on the mic before their opponent entered introducing everyone since he left only they should be allowed to announce themselves. Eddie went on to mention he is THEE Attack Original, and being on the main names to bring up Attack Pro Wrestling in it’s popularity, he can easily burn it to the ground, and that’s what Nothing To Prove want to do. Team Dragon Pro then each independently emerged on the start, and then… carnage! It started with everyone brawling around the outside of the ring, and then everyone being able to get some big signatures moves on each other before some level of control was brought to the actual match. Nothing To Prove worked as a more cohesive unit as they have been for months now. Eddie was the strong man of the group as he is known for. Drew was the risk taker, going to the top rope on many occasions to make a speedy impact. LK and Elijah made use of their tag team experience whenever they were in the ring together, and even separately they dealt many painful blows to the heroes for the match. But Team Dragon Pro wasn’t looking to lose this Another of Will Ospreay’s Frontline Wrestling’s Young Lions, Nico showed everyone that he was in it to win it with out of this world top rope manoeuvres and unique counter and double team moves with his other team mates. He even executed TWO Shooting Star Presses from the top rope mere seconds apart from each other!! Rickey showed that he is a powerhouse like none other, and maybe unintentionally, a super happy go lucky guy. One exchange when Drew was on the offence against his own team after executing a top rope manoeuvre, he louder exclaimed, ‘HE JUMPED OFF THE ROPE WITH ONE FOOT!! !’ and had the biggest smile on his face. RSP is too pure for this world. He then proceeded to manhandle the rest of NTP and even tossed Drew a near TEN FEET IN THE AIR, FROM THE STAGE INTO THE RING! His mood can really escalate for sure. The fan favourite of the night, Beano was all over the place in the best way. He hit the ground the running as he wanted to do Dragon Pro proud by being as explosive in his moves as he possible could. He executed some unique flashy moves alongside his known strikes and speed, this level of intensity from the Original Badman was a welcome pace from his usual rallying of the crowd. If anything, they cheered alongside him as he kept getting more and more into the match. And of course, the master himself. The Sensei we all need in our lives, the ‘Sen-SHAY’ if you will! (I’ll stop now) He showed everyone just how much of a master of Shay-Fu he really is as he went after everyone in the match with martial arts-based strikes and agile movements to get the better of whoever he was in the ring with and leave them reeling in out of body levels of shock. When all was said and done, after an exchange of finishing moves by our heroes, it was a well placed #Shay-Fu ‘One Inch Punch’ from Shay to Elijah that scored the pinfall victory. The crowd rose to their feet in a show of appreciation of a truly amazing main event. All the heroes sat cross legged as the crowd sang to Creed’s ‘My Sacrifice’ (Shay’s theme) while referee Huw handed Shay a yellow belt. That’s right! Shay graduates from a White Belt in Pro Wrestling… TO A YELLOW BELT!! What a story-book ending moment for this truly great show. The show from top to bottom was better than anyone could have hoped for. All the talent involved stood out in their own way. The debutants who competed in matches all shown true confidence and held themselves well in their characters, Fletcher Law has an interesting character about him that’ll be fun to see evolve over time. Carlos, Lovegun and Malik had impressive showings. CYRK are perhaps my new favourite thing and I eagerly anticipate what they can do in the ring. And everyone else who competed from the regular names brought their A game. 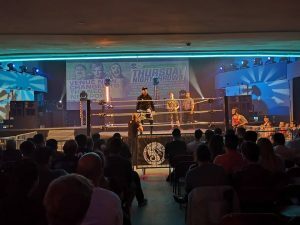 Even the crew who helped out with ring set up didn’t slack off as they made sure the ring was in top condition throughout the show between every match and during the interval. Everyone should feel proud of the show they put on, I know I was for them. And with that, make sure to check out all of Attack Pro Wrestling’s and Dragon Pro Wrestling’s Social media links which I’ll include below. Including one to the ticket site for Dragon Pro’s next event at The Neon in Newport, ‘Dead Already!’ on Sunday 21st October.